Krazy Glue forms an instant, long-lasting bond on most surfaces, including ceramics, pottery, glass, wood, leather, rubber, metal, vinyl, and plastic (PVC, ABS, and FRP). Krazy Glue offers excellent surface coverage, and it's great for hard-to-reach areas. 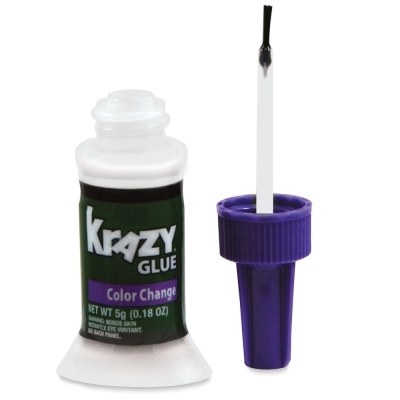 This Krazy Glue goes on purple so you can see where you're gluing and then dries clear. Its brush applicator is great for getting into small, hard-to-reach spots or covering large areas. Glue stays fresh in the no-clog bottle, and the bristles of the brush don’t stick together. 5 g (0.18 oz). ® Krazy Glue is a registered trademark.